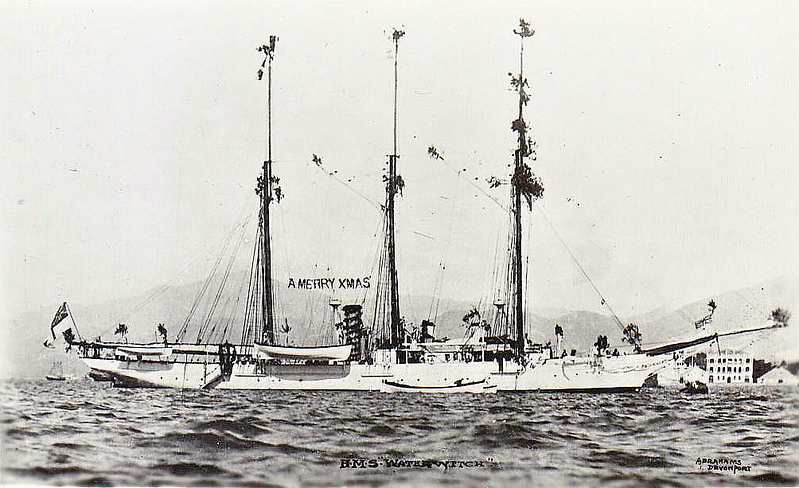 1893 to 1912 - WATERWITCH - Composite Survey Ship - 479 tons - 48.8 x 8.0 - 1878 Robert Steele & Co., Cartsburn, No.107 as private yacht LANCASHIRE WITCH - 03/93 bought by Admiralty, 1894 Australia, 1898 China, 1900 Boxer Rebellion, 1908 Singapore, 01/09/12, while lying at anchor off the mole at Singapore Harbour, she was struck amidships by SEAMEW, the personal launch of the Governor of Singapore. The launch's sharp prow pierced WATERWITCH's wooden side, and she then compounded her error by putting her engines hard astern. WATERWITCH's bridge collapsed, her mainmast fell over the port side, and the resulting gaping wound in her side allowed an overpowering in-rush of water. WATERWITCH sank in 24ft of water. At low water, her masts, funnel, and the highest parts of her superstructure remained above water. Two members of her ship's company were drowned.